Welcome to video three of the Lead Guitar Quick-Start Series. In this lesson we cover the major scale, which is the foundation for the other scales and chords you’ll learn as a guitarist. We’ll go over the mechanics and memorization of the major scale, and you’ll start to practice this scale shape with a jam track. Before we start learning the major scale, let’s look at how to read a scale diagram. Scale diagrams have six vertical lines, and the line on the very left represents the low E string and the line on the right represents the high E string. The horizontal lines of the diagram represent the frets. You’ll see that the scale diagram has many dots on it, and some dots are filled in while the rest are not. The dots that are filled in are the root notes for the scale you’re playing. Since the scale we are learning now is the G major scale, these root notes are all G notes. The circles that are not filled in are simply the rest of the notes in the scale. Inside the circle you’ll see a number, which represents which finger you should play the note with. That brings us back to the designated finger concept, which I mentioned in the first video. This technique means that you will have one finger designated to each fret. With the G major scale, your first finger will play any notes on the second fret, your second finger will play notes on the third fret, and so on. 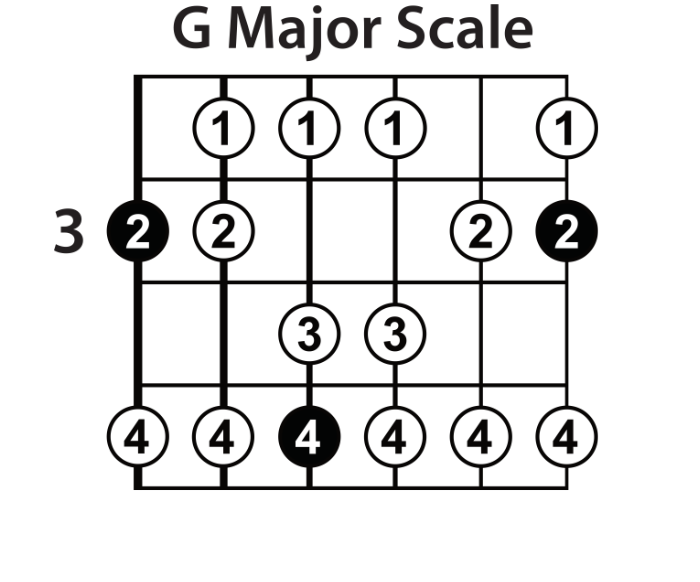 The major scale has seven notes, but looking at the scale diagram, you’re probably wondering why there are more than seven notes in this scale shape. Essentially, once you’ve played the first seven notes in the scale, you’re going to repeat those notes in a higher octave. Okay, let’s jump into this scale shape. The first note you’ll play is the lowest note of the scale, the G root note. Play this note with your second finger on the low E string on the third fret. The second note is on the fifth fret, and you’ll play this with your fourth finger. Now we’ll move to the second string, where your first finger will be on the second fret, then second finger on the third fret, and your fourth finger on the fifth fret. Those are the three notes on the A string. After trying out the first two strings of this scale, you’re already seeing how the designated finger concept kicks in. Take a moment here to practice the notes on these two strings to get really comfortable with them, and like I did in the video, practice going both up and down the scale. Now let’s add in the notes from the third string. We’ve got the first finger on the second fret, third finger on the fourth fret, and fourth finger on the fifth fret. Adding in these three notes on the D string completes the seven notes of the first octave, and brings us to the next G root note. First try working on these three notes, and then add them into the rest of the scale. Moving to the next octave, let’s look at the notes on the fourth string. The G string is easy because the pattern is the same as the D string you just learned. It’s the first finger on the second fret, third finger on the fourth fret, and fourth finger on the fifth fret again. Noticing similarities and patterns like this in scales will make memorizing the scales easier for you as you learn. Moving on to the fifth string, the B string only has two notes. Second finger on the third fret and fourth finger on the fifth fret. As usual, get comfortable with those two notes and then practice them with the rest of the scale. We’ll finish the scale with the last string. On the high E string there are three notes. First finger on the second fret, second finger on the third fret, and fourth finger on the fifth fret. Now that you’ve seen the entire major scale, work on memorizing the scale shape and getting comfortable with the notes. Don’t worry about learning it as quickly as this video because you can take your time to practice the scale as much as you need to. Something else I want you to realize is this scale is movable. If I take the G major scale shape and move it to another set of root notes, it becomes another scale. For example, if I move up two frets, it becomes an A major scale using the same shape as the G major. Going forward, it will be helpful for you to memorize where the root notes of scales are. I’ve made a jam track so you can work on this major scale with some real music behind you. Pull up the jam track I’ve given you and start using the track like metronome to get comfortable with your scale shape. 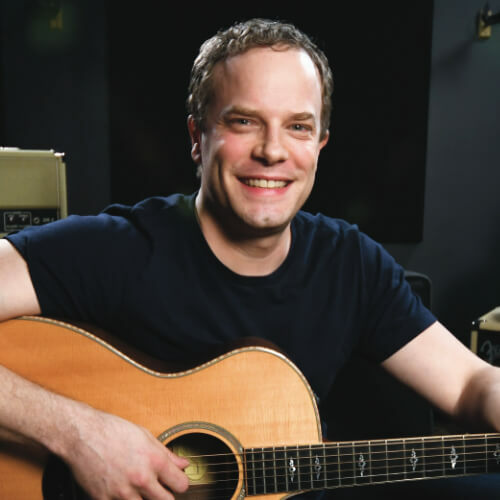 Once you’re comfortable, you can start to emphasize the root notes of the scale by starting, ending, or even pausing on the root notes when playing. After you’ve got the scale shape and root notes down, you can start to improvise and make up your your own melodies and solos using the G major scale. Take a look at the video for an example. As you practice, don’t forget about the universal tips we’ve gone through in previous lessons, and remember to practice your scale along with real music using the jam track or other songs. In the next lesson of the Lead Guitar Quick-Start Series, we’re going to learn another important scale, the major pentatonic scale. If you have any questions in the meantime leave a comment below. See you in the next lesson.